Hi, this PR is an implementation of the Neighborhood Components Analysis algorithm (NCA), a popular supervised distance metric learning algorithm. As LMNN (cf PR #8602) this algorithm takes as input a labeled dataset, instead of similar/dissimilar pairs like it is the case for most metric learning algorithms, and learns a linear transformation of the space. However, NCA and LMNN have different objective functions: NCA tries to maximise the probability of every sample to be correctly classified based on a stochastic nearest neighbors rule, and therefore does not need to fix in advance a set of target neighbors. There have been several attempts to implement NCA (2 PRs: #5276 (closed) and #4789 (not closed)). I created a fresh PR for sake of clarity. Indeed, this code is intended to be as similar to LMNN as possible, which should allow the factorisation of some points of code which are the same in both algorithms. At the time of writing, this algorithm uses scipy's L-BFGS-B solver to solve the optimisation problem, like LMNN. It has the big advantage of avoiding to tune a learning rate parameter. 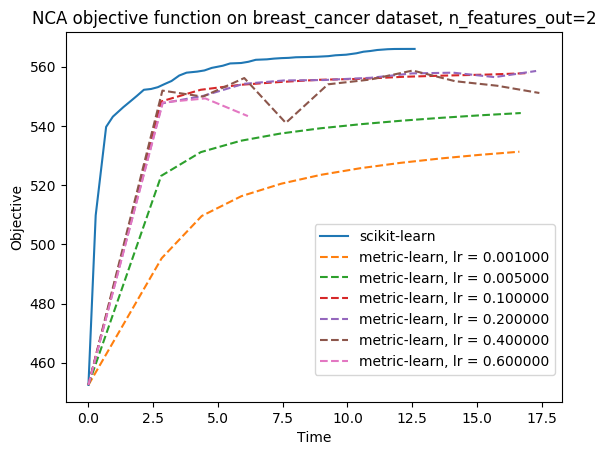 I benchmarked this implementation to the package metric-learn's one (https://github.com/all-umass/metric-learn): the one in this PR has the advantage of being scalable to large datasets (indeed, metric-learn's NCA throws Memory Error for too big datasets like faces or digits), for no significative loss in performance for small datasets. Make it possible to pass sparse matrices as input? Indeed, they do not add a significative speedup but have a high memory cost. With np.dot(X, transformation.T) you save a transpose. True, I will change it. Hi @wdevazelhes , since the code is very similar to LMNN, I felt free to add just a couple of comments, by no means a full review. @jnothman , I hope I didn't break any contribution guidelines..
You could just add the matrices without transposing, and transpose the gradient once before returning the unraveled gradient. I remembered I had seen a more efficient computation of the gradient (see last equation in slide 12 here: http://bengio.abracadoudou.com/lce/slides/roweis.pdf ). Since I already computed embedded differences for the softmax before wouldn't it be more efficient to reuse it ? I agree that the expression with (1 - p_i) is clearer though. Merging #10058 into master will increase coverage by 0.01%. The diff coverage is 99.65%. Powered by Codecov. Last update 1f2f167...48cab11. Read the comment docs. Thanks for your comments @johny-c ! I have modified the code according to them. 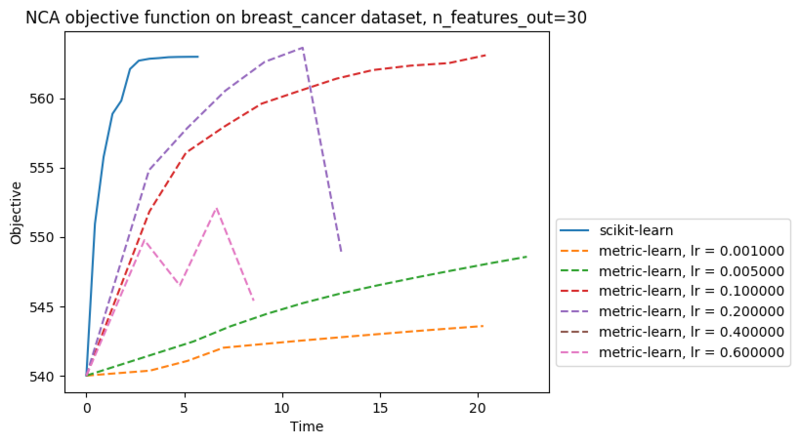 I benchmarked this PR implementation of NCA against metric-learn one: I plotted the training curves (objective function vs time), for the same initialisation (identity), on breast_cancer dataset, on my machine which has 7.7 Gb of memory and 4 cores. Since metric-learn optimisation is a sort of variant of stochastic gradient descent, it needs a learning rate to be tuned (contrary to this PR implementation), so I plotted the curve for several learning rates. to :meth:`fit` will be used to initialize the transformation. This is because pca, identity, random and numpy array are not arguments but they are possible choices for argument init. I took the syntax from LMNN. Should I write it in another way ? This looks ready to merge for me. @agramfort : can you check a second time? is it raveled here or not? ok did one (last?) round. There just remains to settle on #10058 (comment), and check on #10058 (comment) and maybe wait for @johny-c to put his email (otherwise he could do it after) ? Otherwise I addressed all your comments, so, it's ready @agramfort @GaelVaroquaux ! LGTM. +1 for merge once the CI has run. Indeed, core devs should decide whether they also want to include LMNN (#8602). I think it would be good as LMNN is also a popular method and there is quite a lot of code that could be shared with NCA. Hi all! @wdevazelhes, congrats and thanks for including me as an author. Regarding LMNN, as far as I remember, what is missing is some testing . I will have a couple of free weeks in March, so I could have another look at it.